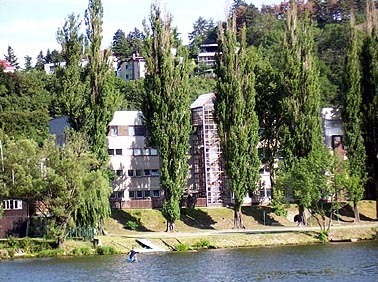 Bohemians hotel is located directly on the Vltava riverfront in a peaceful part of the city surrounded by greenery. Thanks to its location, the hotel can offer accommodation in Prague, providing easy and comfortable access to the downtown and all sights. You can get from the hotel to the city centre in only 12 minutes. You can get from the hotel to the city centre in only 12 minutes, on a sightseeing tram ride along the Prague riverfront. 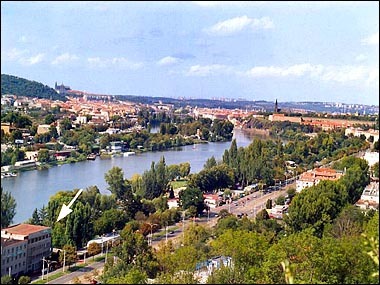 The National Cultural Monument Vysehrad is in the walking distance from hotel (approx. 1500 m). We offer accommodation in 23 double rooms with total capacity of 46 beds. Eight rooms can be equipped with extra beds. All rooms have a private bathroom with shower and Wi-Fi internet connection. A fridge is available in 6 rooms. Breakfast buffet is included in the price. Room with two double beds (another extra double bed possible), kitchenette and bathroom with shower. We offer secure parking lot free of charge - for passenger cars, minibuses and buses during the day watched by camera and during the night the gate is closed). Hotel reception is open 24 hours a day and offers all usual services, sell drinks and personal care products, rent iron or hair dryer and can keep your valuables in a hotel safe. Prices include VAT, but do not include breakfast and local charges. Children up to 6 years with 2 adults - free of charge.